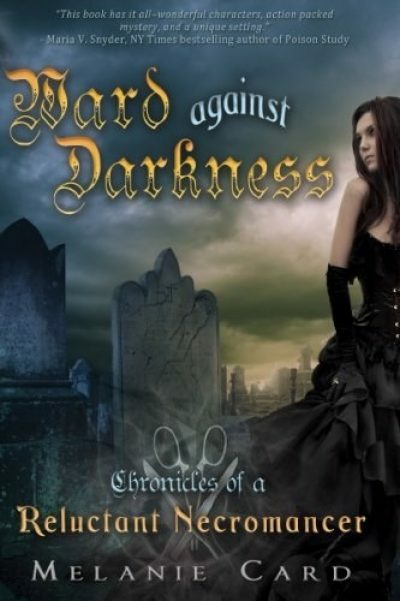 2013’s Ward Against Darkness is the second volume in Melanie Card’s Chronicles of a Reluctant Necromancer series. The good news is that Ward De’Ath is spending less time worrying about being outed as a practitioner of the forbidden surgical arts. That’s because he is facing a far more immediate problem: a band of highly motivated assassins want to kill Ward and his dead…ish companion Celia. Ward and Celia manage to elude their hunters and head for a wilderness that might just be wild enough to hide them. There’s just one catch. Macerio, the proprietor of the “inn” where they end up. Macerio is a necromancer and not one of the nice ones. He isn’t the world’s evillest necromancer. He is simply the former student of the man who was the world’s evillest necromancer before he was executed. But he is ambitious and hard working and he may well attain Big Badness. He has commandeered an isolated inn and filled it with vesperitti (vampires), bewitched victims (vesperitti food), and would-be apprentices. By rights, Ward should have been just another victim. But he is mistaken for an apprentice Macerio has been expecting. Undead…ish Celia is assumed to be a vesperitti of Ward’s making1, proof that he is the right sort of necromancer to serve Macerio. The master necromancer uses a particularly harsh pass-fail system. If Ward does not pass the test, he will become food for the vampires (or worse). Since Ward is at best a middling necromancer, his odds of winning are poor. The sensible thing would be to steal some supplies and flee. Ward did not become a social pariah stalked by heavily armed killers by being sensible. He must stop Macerio by stealing his grimoires and then fleeing. Duty calls! Excelsior! This would be a suicide mission were it not for an unexpected ally. Allette desires more than anything to be free of her necromantic master. Helping Ward is her best hope for freedom. It’s true that she’s reluctant to admit she’s a bound vampire rather than just another enthralled happy meal. Her desire for escape, even at the cost of her own existence, is genuine. In any case, if you cannot trust a beautiful vampire, whom can you trust? Readers may be wonder how it is that two people randomly stumbling through a forest should happen to encounter a nest of villains. There’s a sensible answer. Macerio has set a spell trap that attracts people to the inn. Normal people become food, and potential villains become vesperitti or are recruited into the Supervillain Apprentice Show. Macerio doesn’t seem to have taken into account the possibility that he’d pull in someone with the means and motive to oppose him, probably because at this point Macerio is very likely the most powerful living necromancer2 on the planet. Hey, wait, what about undead…ish Celia? What is she doing all this time? Well, she does get her own B plot (it turns out one of the vesperitti is old friend Val) and her creeping-around-in-the-dark skills come in handy. But I was disappointed that Celia’s body count wasn’t higher. Waste of a good resurrected assassin. Humph. Rules against necromancers and their (generally temporarily) resurrected subjects becoming entangled (romantically or otherwise). Try not to think about why this society has occasion to have those rules. A romantic rival for Celia’s attentions in the form of Val, who, being a vampire, is perhaps a better match. Generally it’s a bad idea to kill off the Big Bad in the second of four volumes, but it’s going to take at least one more volume, maybe two, for Ward and Celia to hold hands, let alone kiss. There’s good reason to think that by dealing with Macerio in the manner that Ward did, he facilitated the emergence of a bigger bad. Good intentions and all that. I’ll be interested to see how this turns out. Ward Against Darkness is available here (Amazon) and here (Chapters-Indigo). 1: It’s not clear just what Celia has become thanks to Ward’s ministrations, but some possibilities are ruled out in the course of this volume. 2: Necromancers are not considered evil in this fantasy world, whereas surgeons are. Socially responsible necromancers can actually (temporarily) revive the dead, whereas surgeons generally kill the people they are trying to cure. What with lacking a germ theory of disease and all. I got confused. So necromancers are legal...ish, surgeons aren't, and necromancers aren't allowed to romance their, uh, patients. Got it. And Macerio is the most powerful living necromancer, but apprenticed to a master who is more evil and either (1) less powerful or (2) not living. Um. Can a dead person practise necromancy or is that considered cheating? Is a necromancer powerful because they are good at it, or necromantically muscular distinct from skill, or does power consist of it is probably owning a larger number of dead people? In which case having one...ish is pretty low on the scale. And, does it work on dead animals? According to literature, this has drawbacks as well. Clarified the phrasing: the evilest necromancer was annoying enough the other necromancers killed him. Usually, it's not possible to permanently revive dead people without turning them into some sort of abomination (why Celia hasn't dropped dead again and what exactly she is an open question). At least one vampire seems to be able to affect necromantic magic but they needed a necromancer's help so it may be the dead or undead cannot themselves do necromancy on their own. Macerio is a problem because he has a lot of raw power (more than Ward), centuries of experience, and grimoires that amplify his power. So, potential, experience and tools. Oh, and a complete lack of ethics inhibiting him from doing stuff that could potentially break the world. Just to check another detail, a "grimoire" is a textbook, and you read it to learn techniques - yes? So, worth stealing from an enemy, or destroying. Or copying. But there's always chance that an author who doesn't check the dictionary decides that "grimoire" means a kind of special magic gemstone, or, as I sort of suggested, an undead servant that you can use as a magic power-booster somehow like the extra rockets that the Space Shuttle used to give it more rocket. Whatever they are, anyway, Macerio has those, and natural magic muscle, and experience (which is like having books, except that books, again, usually only help if you make time to study and read them) - and...running The Exorcism Factor judges' houses episode deep in the forest all this time may have actually kept him from causing more trouble for other people, or catching up with that reading?